In this article we will discuss how to increase disk space on a Linux Cloud Server after increasing the existing disk space for the server through cloud Control. This article describes how you can manually increase the existing physical volume size of Cloud Server or Virtual machine. Follow the below steps to increase the VM disk size. Once the disk space increase on Cloud Server log into the server via SSH or console. 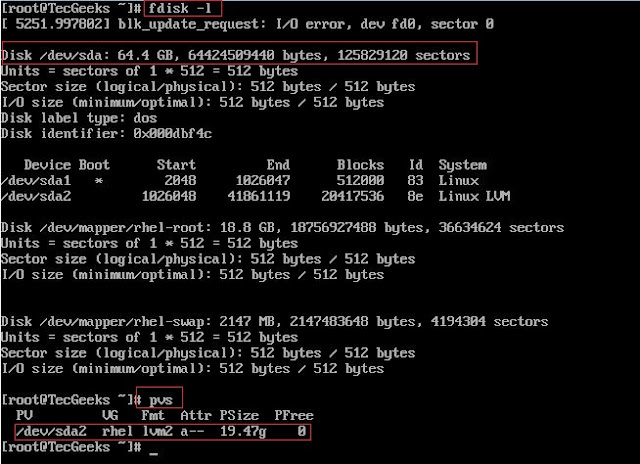 Run fdisk -l to check the total size of the disk. 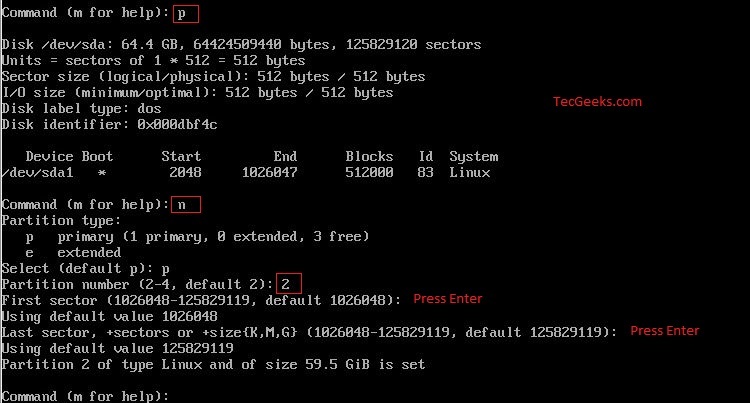 You will notice that one of the partitions is Linux LVM and the full disk size is not been utilized, Type the pvs command which stands for physical volume show. We have to add newly added unallocated disk into LVM. 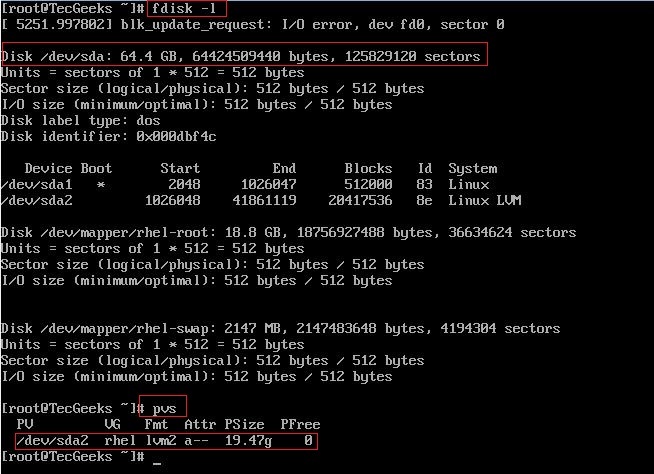 Check and make sure that the difference in size between the fdisk output and the PSize value shown from the pvs command, and fdisk output should be more than pvs output. Fdisk will prompt you to enter a command. Type p for print the partitions on the disk. Here will create new partition from unallocated space read this post for Fdisk command for more details. Next, type p for primary partition. Type 2(depends on number of partition you have ) as the partition number . When prompted for the First cylinder, simply press ENTER to use the default value. When prompted for the Last cylinder, simply press ENTER again to use the default value. Type t to change the partition type. Type 2 as the partition number . Type 8e (as this is partition ID for LVM) and press ENTER. You should see that the partition type has been changed to Linux LVM. Type p and press ENTER to list the partitions again. This time the second partition should be Linux LVM as we just changed it. Type w and press ENTER to write (save) changes and quit fdisk. You will receive a notice that the new partition table will be used after the next reboot. Reboot the server by typing init 6 or run partprobe /dev/device name. 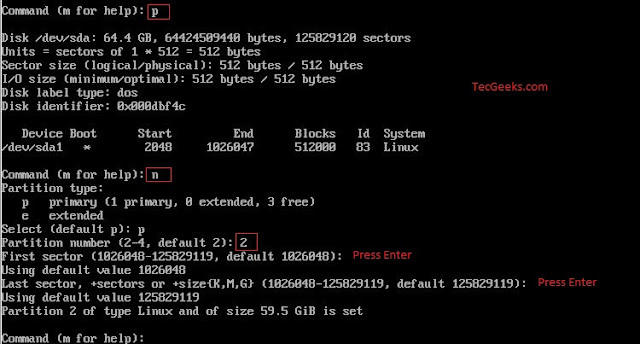 wait for few minutes to reboot the server , then connect via SSH or console again.Type fdisk -l and press ENTER again to check the disk size. The disk size listed by fdisk should not have changed. Type pvresize /dev/sda2 . You should use the Disk name shown in the output of fdisk -l) and press ENTER. You will receive a notice that the physical volume has been resized. Type command pvs and see The PSize value should be now increased. You are now finished!